Lace up your running shoes or riding boots: it’s time to get on the move for a good cause this weekend. On October 16, head for the shore for the annual Atlantic City Marathon. This year’s course will take runners down the famous Boardwalk, through the city, and past the local wind farms before making its way toward the charming cities of Ventnor, Margate, and Longport. For those who prefer a shorter course, there’ll also be a half-marathon, 10K, 5K, non-competitive Health Walk, and Kids’ Fun Run, all of which will be held near the beautiful Atlantic Ocean. Twenty Cheer Zones with live entertainment will line the route so family and friends can encourage their favorite runners. After the race, stay for a Sports and Fitness Expo with more than 50 vendor booths and a pasta dinner for participating runners. Partners of the AC Marathon include the American Heart Association, Alex’s Lemonade Stand, Boomer Esiason Foundation, Front Row Foundation, Juvenile Diabetes Research Foundation, Team Continuum, Crohn’s and Colitis Foundation, and Team in Training. The race begins at 8 a.m. To register or receive more information, visit acmarathon.org. 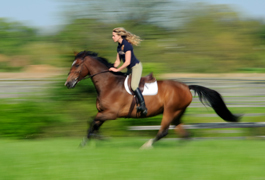 Saddle up on October 16 for Ride for the Cure at Bow Brickhill Stables in Milford. This inaugural event will feature a ninety-minute trail ride through Alexandria and Holland Townships followed by live music, prizes, and a hearty lunch. Ambrose Photography will be on hand to take pictures of riders and their mounts and a tack sale will also be held. Ride for the Cure benefits Susan G. Komen for the Cure. Riders must provide their own mount and registration is limited to the first 150 riders. To register, visit komencsnj.org/site/TR/RidefortheCure.